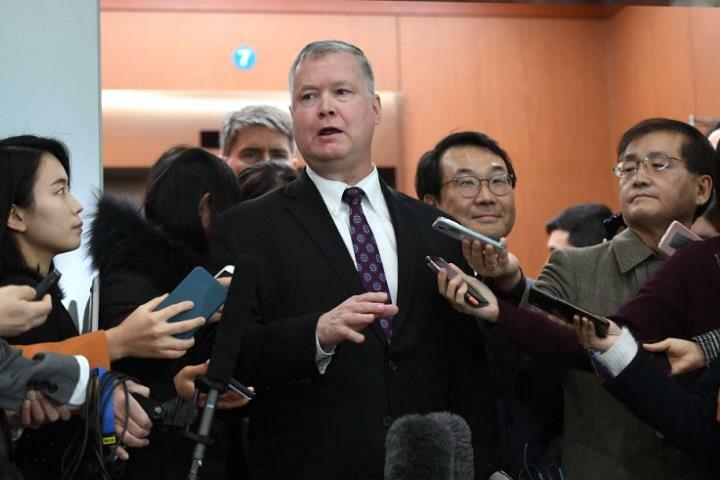 Stephen Biegun (C) speaks to reporters in Seoul on December 21, 2018. The US State Department has confirmed its key diplomat on North Korea will meet an official from Pyongyang next week to discuss an end to the North's nuclear weapons programme. Special representative Stephen Biegun arrives in Seoul on Sunday ahead of talks with North Korea. He is scheduled to meet Kim Hyok-chol, a former ambassador to Spain, but the exact date or location for the talks have not been announced. Bruce Harrison reports from Seoul.